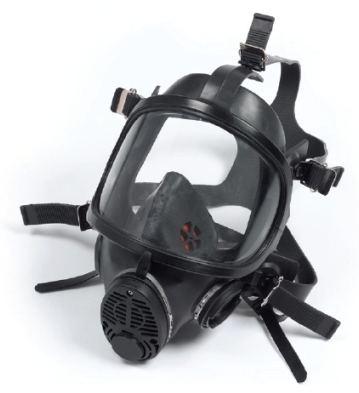 Available in two different sizes, the Sabre Safety Panaseal Face Mask accommodates a wide range of facial shapes and sizes. The Panaseal features a Neoprene outer mask with reflex seal and Neoprene ori-nasal inner mask and is positive pressure. The visor of the Sabre Safety Panaseal is single curvature and is made of scratch and impact resistant polycarbonate material with a flame retardant coating. This provides the user with excellent panoramic vision. The Panseal's visor is held in position by two U-shaped clamps. The Panaseal has been designed so that the wearer can wear integrated spectacle frames without any compromising of the facemask seal. The Panaseal is available with either a five-point fully adjustable neoprene strap style harness or a two-point adjustable Polyester or Kevlar net style harness. The Sabre Safety Panaseal features a left hand side bayonet connection for the demand valve. There is also the option of an additional right quick-fit port in order to take a communications interface, which is also available separately. A speech diaphragm is mounted at the front of the mask to offer unimpeded speech transmission and there is a low resistance positive pressure exhalation valve that allows for normal breathing with no extra effort. The mask is designed with separate inspiratory and expiratory paths to minimize the risk of cross contamination of second stage regulators.